Governor Cuomo today announced the appointment of a new task force that will provide recommendations to further improve the Great New York State Fair. The Task Force will recommend improvements for Phase Two of the State Fair Master Plan and evaluate options to maximize the State’s historic investment and grow the region’s economy. The Task Force recommendations will build on the state’s sweeping $50 million plan to revitalize the historic fairgrounds in Onondaga County. The state will invest as much as an additional $50 million for the completion of Phase Two of the Master Plan, pending the recommendations of the Task Force and Legislative support. 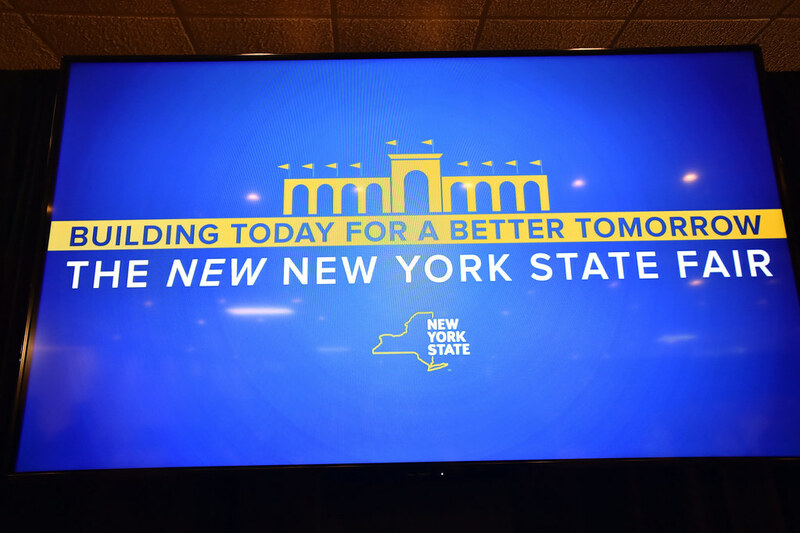 The Governor also announced that the 2016 New York State Fair – which generated the highest level of attendance in its 175-year history – received record approval ratings as a result of the state’s historic investment to transform the fairgrounds. The fair’s annual survey found that 87 percent of the 2016 State Fair attendees rated the changes to the fairgrounds this year as positive. The fair also received record-high ratings for its family-friendliness and affordability. The Governor made these announcements and highlighted the success of the 2016 Great New York State Fair at an event today in Syracuse. State Agriculture Commissioner & Co-Chair of the State Fair Task Force Richard A. Ball said, "The Governor's $50 million plan truly reinvented the State Fair, while remaining true to its focus on agriculture, great food and music and family fun. The changes were clearly met with great enthusiasm and the record crowds were proof positive that we got it right. The success of this year's Fair also reaffirmed its importance as a major economic engine for Central NY and the State, and it is critical we continue to invest in its growth. I look forward to the discussions of the new task force, which, I have no doubt, will provide valuable feedback and innovative ideas on phase 2 plans that will take the New York State Fair to a whole new level." The Governor charged the new task force with making additional recommendations and developing fresh ideas for Phase Two of the State's ongoing investment in the fairgrounds. The recommendations will build on the success of Phase One of the state’s $50 million improvements to the fairgrounds. The Phase One improvements were debuted at the 2016 State Fair and included a new welcoming Main Gate, an Empire RV Park and wide open spaces for vendors and a reconfigured Wade Shows Midway. The Task Force will meet in November to review the State Fairgrounds Master Plan developed in 2015, and provide the Governor with their recommendations for additional investment opportunities by the end of the year. Ensuring the fair remains a world-class showcase for our TasteNY entrepreneurs and leveraging the state’s beer, wine, spirits, yogurt, cheese, maple syrup industries. The presentation delivered by Commissioner Ball at today’s event is available here. The newly transformed 2016 Great New York State Fair received record approval ratings as a result of the state’s historic investment to transform the fairgrounds. The annual customer satisfaction survey conducted by the NYS Fair found that 87 percent of attendees surveyed believe the changes to the fairgrounds were positive, with 70 percent rating the changes as very positive. These are the highest ratings given since the survey began in 2008. When respondents were asked what improvements they noticed, the number one item mentioned was “more space or openness,” at 44 percent, with 88 percent giving the “openness feature” a positive rating. In addition, 29 percent of respondents mentioned the new Main Gate, with a 90 percent favorability rating, and 24 percent mentioned the new Midway, where 97 percent of fairgoers had a positive experience. The fair also received the highest ratings ever for affordability, with 79 percent of attendees surveyed rated the fair as either somewhat or very affordable – a full 10 percentage points higher than the year before. The revitalized Wade Shows Midway, in its new, larger home, also scored the highest marks in the survey’s history, with 97 percent of respondents saying the Midway experience was very positive. Additionally, 85 percent of fairgoers surveyed rated the fair as family-friendly, with 52 percent saying that family-friendliness had increased since their last visit. Agricultural exhibits remain one of the top three things visitors like about the fair and attendance at many of these exhibits increased significantly. The Dairy Products Building was the most visited agricultural exhibit with 85 percent of fairgoers stopping by, compared to 63 percent last year. The butter and cheese sculptures also continue to draw large crowds. Eighty-one percent of fairgoers visited these popular attractions. The Horticulture Building was the third most visited agricultural exhibit, attracting 66 percent of fairgoers. In addition, a long-standing Fair favorite, the Dairy Cow Birthing Center, received the highest satisfaction rating of any exhibit with 83 percent of fairgoers rating it a very positive experience. More than 600 fairgoers participated in the 59-question survey, which the Fair has conducted seven times since 2008 and annually since 2013. CCRG Marketing conducted the survey interviews on behalf of the fair. The 2016 Great New York State Fair generated the highest level of attendance with a record 1,117,630 visitors. The Governor’s $50 million fairgrounds investment – which included a new welcoming Main Gate, wide open spaces for vendors and its Midway, and $1 million I LOVE NEW YORK marketing campaign – drew the biggest crowd in the fair’s 175-year history. The expanded Wade Shows Midway set records for revenues and number of rides provided, while fairgoers flocked to the Fair's lineup of musical and grounds performers. The fairgrounds’ new Empire RV Park was sold out. Senator Patty Ritchie said, "Building off of the unprecedented success of this year's State Fair, the Task Force will envision how to further improve the Fair and maximize its economic benefits for the region. Governor Cuomo's commitment to showcasing this state’s growing agricultural industry is epitomized by the state's record investment, and the future success of the fair will continue to support New York’s economic resurgence. This Task Force will go a long way toward securing this Fair’s role as an important economic generator for the region and I am proud to serve on it." Assemblywoman Pamela Hunter said, “The revitalization of Central New York we have undertaken with Governor Cuomo has been extraordinary, and the State Fair is a crown jewel of the region's success. By attracting visitors and revenue to Central New York, the Fair is a vital asset in bolstering the economy, and this Task Force will take the Fair to the next level by generating even more economic activity. I look forward to what we will achieve in the near future." Assemblyman Al Stirpe said, "The State Fair is one of Central New York’s proudest traditions and each year it brings in tourism dollars and economic activity to the region. Working with the Governor and my partners in the legislature to continue our commitment to the fair and the state's $50 million investment in the fair's main gate, the new RV Park and Midway, the 2016 State Fair was the most successful fair we've had in decades. I look forward to what Phase Two will bring and I am honored to serve on this task force where we will continue to make the fair better each year." Assemblyman Bill Magee said, "For nearly two centuries, the Great New York State Fair has been a proud New York State tradition, and this Task Force will re-imagine the Fair for the future. The major improvements of the Fair under Governor Cuomo's leadership have already had a transformative effect, as evidenced by the record turnout and approval ratings. The next steps established by the Task Force will attract even more visitors to wonder at the marvels of the fair and contribute to the region's growing economy." The New York State Fair, operated by the New York State Department of Agriculture and Markets, runs from August 24 to September 4, 2017. The Fair's mission is to showcase the best of New York agriculture while providing top-quality entertainment. The home of the Great New York State Fair is a 375-acre exhibit and entertainment complex that operates all year. A year-round schedule of events is available on the Fair’s website. Find The Great New York State Fair on Facebook, follow @NYSFair on Twitter, on Snapchat at “nysfair” and enjoy photos from the Fair at Flickr.com/photos/nysfair. New Yorkers are invited to send their ideas for the Great New York State Fair at [email protected].